I don't need to tell you the latest episode of Game of Thrones, The Door was a roller coaster of emotion! There were some great funny moments that I literally laughed out loud at, and there were others that simply left me wanting to crawl into the fetal position. With Jorah now having saved Dany's life twice, the knight of the friendzone seems to be back in the good graces of the khaleesi. BUT, there's that pesky greyscale problem, which seems like a good smattering of aloe vera could help a little. But Jorah is commanded to find a cure for it and when he does, he can return to Dany's side. Greyscale in most cases is fatal, but Shireen, Stannis' daughter survived it, so there's hope for Jorah, albeit slim. Kinvara is the High Priestess of the Red Temple of Volantis, and Tyrion wants her to spread positive public relations about Dany's accomplishments. You know, Mother of Dragons, Breaker of Chains, All That... She surprisingly accepts and even goes so far to say that Dany is the Chosen One. But Varys has had a healthy skepticism of religion and magic since a "second-rate sorcerer" cut off his twig and berries. 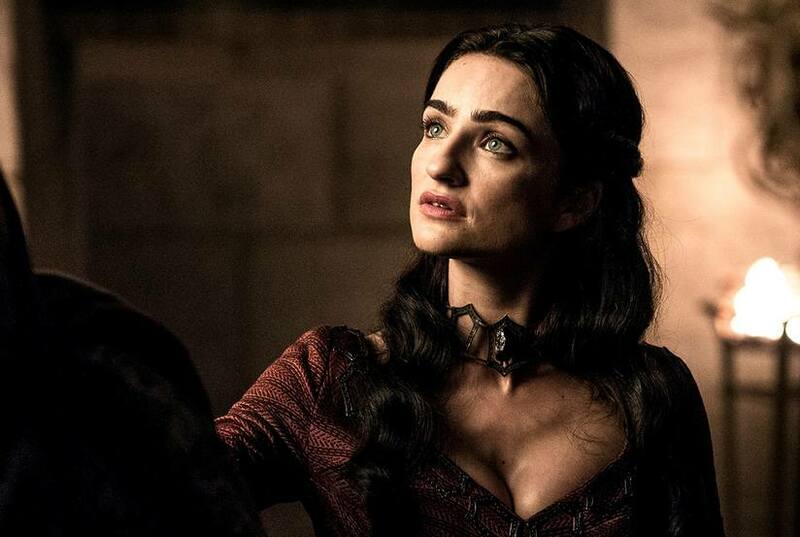 But to prove herself and put some fear into Varys, Kinvara reveals that she knows what happened to him as a child, and that she knows the words that came out of the flames when his junk got tossed into it. 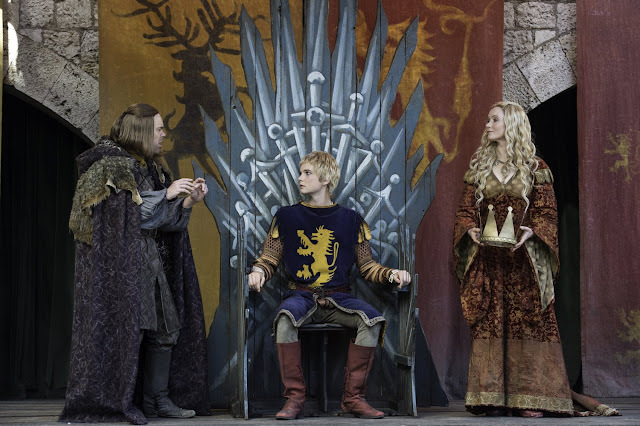 Okay, first off, Game of Thrones: The Play? Completely inaccurate, absolutely hilarious, and totally has to happen as an off Broadway production. The play is unsurprisingly completely Lannister sided, and makes Ned Stark look like an idiot. Outside of that, Arya is hired to kill the actress playing Cersei. But seriously, at one point it looked like she wanted to murder everyone on that stage. Anyway, her plan is to poison her rum but she also has doubts about why she's killing her. Is this a test? Of course it's a test! "I did kill your father. I threw him right off that bridge. And it was a good bridge! But he was the worst king! He was leading us nowhere! I have sailed more and seen more of this world than all of you combined! I'm gonna marry the dragon queen, get her army and her dragons, then we're gonna build a lot of boats. They're gonna be the best boats! And then we're gonna conquer all of the Seven Kingdoms and make Pyke great again!" Littlefinger used his teleporter again to go all the way north to meet Sansa and offer his help. But Sansa wasn't having any of it. "You freed me from the monsters who murdered my family and you gave me to other monsters who murdered my family." True, but despite that, Sansa let Littlefinger live. Is this a sign that he still has some control over her? 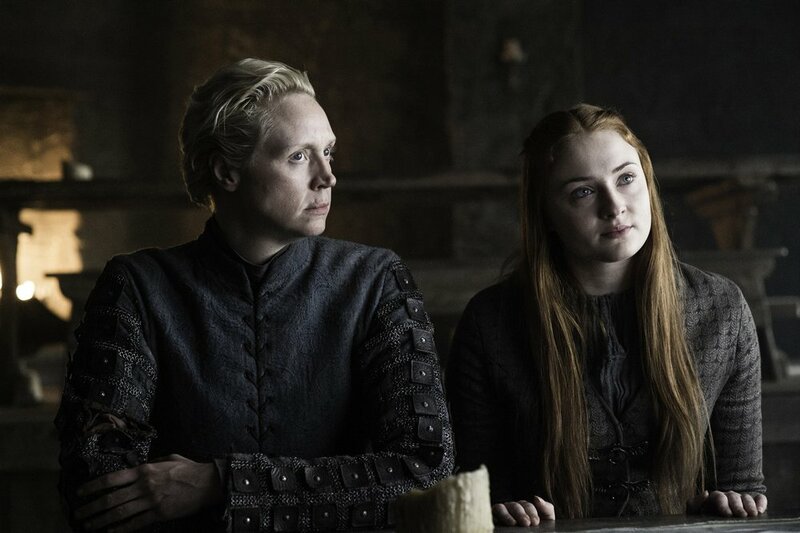 Or is Sansa playing the long game, knowing she'll probably need Littlefinger's army in the future? 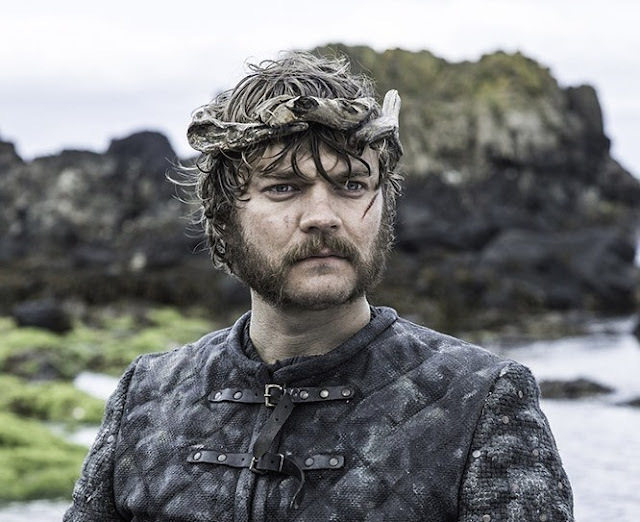 He did manage to pass along some useful information about her uncle the Blackfish having reformed the loyal Tully army and retaken Riverrun. But why did she lie about the source of this information to Jon? Last episode they were just glad to be together again. Why the distrust now? Was it Littlefinger's subtle mentioning that Jon was only a half-brother? And yes, Sansa's been sewing A LOT. A new dress for her and some new duds for Jon. She could totally give Martha Stewart a run for her money. And finally, Edd's in charge at Castle Black, and Tormund is still making googly eyes at Brienne. Things may be dark, but it's nice to have some light moments at the Wall. Before we get to THAT scene, here's what else happened. Bran's history lesson continued when he learned that the Children created the White Walkers to fight against the First Men. The actor who plays the Night King also plays the man who had the obsidian stone pushed into his chest so there should be no question that it's the same guy who's lived thousands of years. After that lesson ended, Bran got bored and decided to go "greensighting" on his own. Bad move because the Night King saw him, grabbed him, and marked him. Now the cave protection was broken and the White Walkers were coming for him. But not before the Three-Eyed Raven could "upload" all of his visions to Bran. And while they were making their escape, the Children of the Forest had to hold off the White Walkers, literally making it Plants vs. Zombies. Bran hears Meera's screams and then wargs into present day Hodor to help who's left escape. Unfortunately, there's a side effect and he also wargs into Wylis in his vision, who essentially short circuits when Meera yells at him to "hold the door." And that was Hodor's purpose. To help Bran and Meera escape and it was fated to happen years ago because of Bran's boredom. Nice going Bran. It really was a heartbreaking episode. 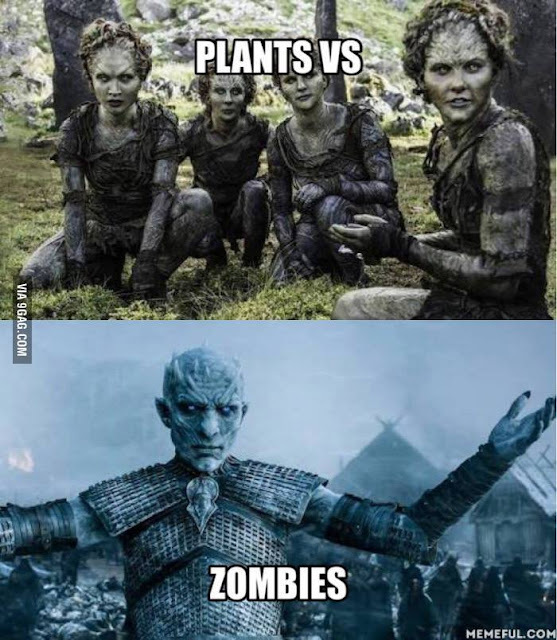 Moreso than the Red Wedding for me. 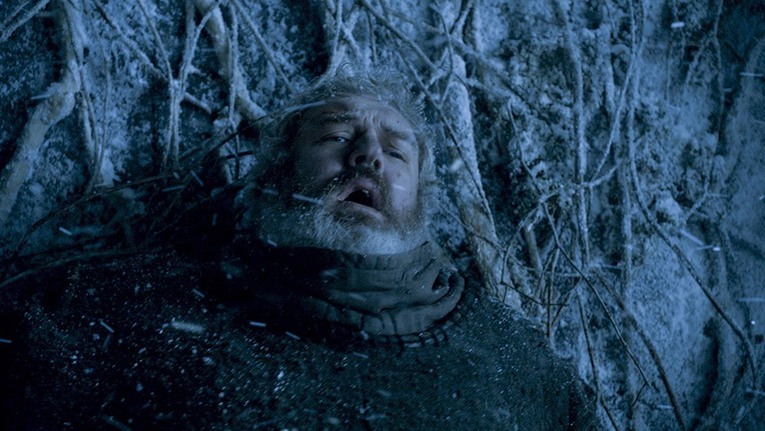 At least we found out why Hodor was called Hodor, and he died saving lives. But more importantly, we now know Bran's visions can affect the past to a certain extent. This effectively closes this time travel loop, but who knows how many more there are? And with the Children all gone, and Hodor dead, how far are Bran and Meera really going to get? In the words of a certain robot from the future, "They're boned." And here's a preview of episode 6 titled, "Blood of My Blood." And one last time, thanks for holdin' that door. RIP Hodor.